I developed a severe case of vertigo or dizziness in 2010. My ENT doctor prescribed Meclizine and Prednisone. Meclizine helped for a few hours at a time. The Prednisone caused heart palpitations. My skeptism of prescription meds made me discontinue the steroid. I could not figure out how a steroid addressed my complaint of vertigo. Without the meclizine, my vertigo was ever present. Frustrated, I located an acupuncturist in my area at The YinYang House. Three treatments with needles CURED my vertigo. I continue to receive regular treatments, four years later, from Chad J. Dupuis, L.Ac enjoying the continued health benefits of acupuncture. Sinus Inflammation. I have lots of allergies. My sinus passages used to swell enough to block my nose breathing daily. Acupuncture alleviates sinus swelling and restores free breathing. Kidney Stone. Acupuncture helped me pass a 7 mm kidney stone, avoiding lithotripsy surgery for the fourth time was one of the best days of my life. Sciatica. I have experienced nerve pain on my left side for years caused by my birth defect. Acupuncture helped to completely resolve my sciatica. I would be remiss not to mention I also use chiropractic to complement acupuncture for this problem. However, I went to a chiropractor for years without total resolution. Irritable Bowel Syndrome (IBS). Regular treatment controls my IBS symptoms of cramps, gas, pain and alternating diarrhea/constipation. Now I experience IBS flare-ups occasionally, maybe every 4 to 6 months. The duration of flare-ups have shortened considerably, 3 to 5 days opposed to 2 weeks. Anxiety. Acupuncture cured my anxiety! I tried meditation, herbs, exercise and lots of self-heal techniques without success. I was able to quit an anxiety drug I took for almost 2 years after receiving acupuncture. Vertigo. Completely cured of vertigo as shared above. Rotator Cuff Injury. The joyous birth of my first grandchild also birthed me a shoulder injury from holding her SO much! My fault totally. I'm happy to report my shoulder is completely healed and I'm still holding that precious baby girl. General Well Being. These days I go to acupuncture to maintain my general well-being. The treatments just make me feel good. No, I'm not some kind of needle fanatic that enjoys pain. I hate pain! I love acupuncture! If you suffer from any of these disorders, please give acupuncture a try. Be sure to check back next Tuesday, I will answer some frequently asked questions about acupuncture. People are generally interested in acupuncture and want to talk about it, if you can get past the crazy looks you're given before the curiosity kicks in! 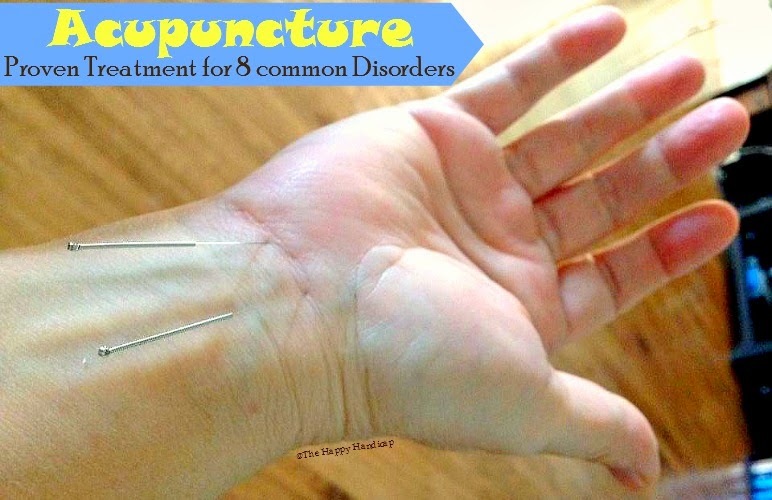 Thanks a lot my friend for sharing this list of acupuncture treatment for 8 common disorders. I am truly very impressed to know about this proven therapy and will definitely visit a professional acupuncture-mississauga clinic for the treatment of my Bowel Syndrome.